The Air250 Standing Hip is the product of choice for athletes. It is essential for developing strength and power, allowing athletes to train at explosive speeds. 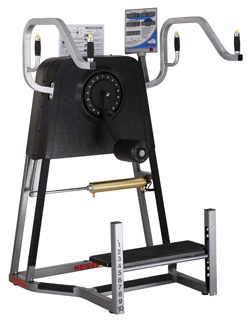 The machine offers hip flexion, extension, adduction and abduction. The foot platform is split to provide the clearance needed to prevent possibly hyperextending the knee if the foot strikes the plate during the leg swing. Its light weight makes the foot plate easy to position at the correct height for almost any user. Arched support bars feature dual resistance controls for forward or sideways positioning and provide more clearance for the knee.